Spring has sprung here at University of Wisconsin–Stout, and, as the weather warms up and we get some green back on our trees, the spring seasons for UW–Stout baseball and softball have kicked-off as well. The season for head coach, Ben Kincaid and the UW–Stout Baseball team has started off 3-8 so far. “We are in the same boat as far as record going into conference, but we made big strides down in Florida. I tell my guys that our season is in three different parts, pre-season, conference and post-season. Our conference season is the most important part of our season, and we feel confident that we will be successful,” said Kincaid. The season began with a couple fun games in U.S. Bank Stadium, and the season continued with a trip down to Fort Myers, Florida during spring break. This season has some exciting games coming up. “I’m most excited for our home series on April 21 and 22. We can show our fans what Stout baseball is all about,” said Kincaid. 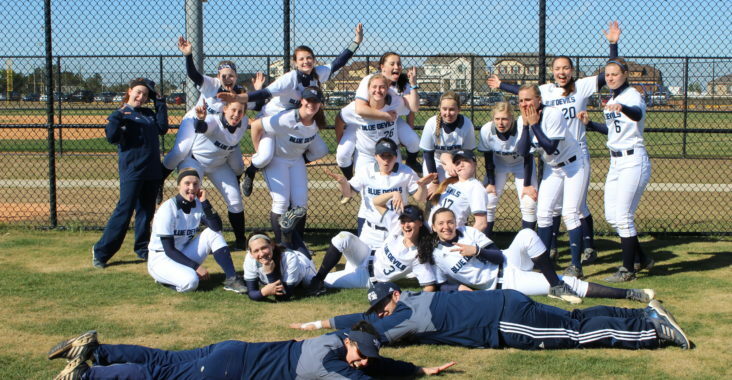 The softball season has also begun, and the team has started rather well. They won nine of their last 10 games and have amassed a record of 10-2. “I’m very excited about this season. We’ve said many times this year that this is going to be a special year for us. The team worked really hard in the off-season and that work is definitely showing right now,” said softball head coach, Becky Iaccino. Just like the baseball team, this year’s softball team also features younger students, with only two seniors on their roster. Both seniors are team captains. “We definitely have a leadership role. Because our team is so young, that means the upperclassmen have to lead by example and show the rest of them what needs to be done. Because Beth and I have been here for four years, we understand the type of competition that the WIAC has and what to expect from each team,” said senior softball player Rachel Thomas.